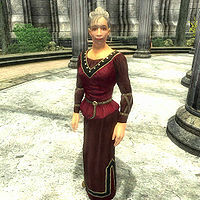 Renee Geonette is an Imperial commoner living in the Imperial City's Temple District with her husband, Salomon Geonette. When she is not in the Imperial City, Renee travels regularly to Anvil to visit Mirabelle Monet; while there, Renee stays at The Flowing Bowl. Renee wears a set of middle class clothing: a burgundy linen shirt, burgundy linens and a pair of pigskin shoes. She carries her house key and a small amount of gold. Speaking to Renee Geonette for the first time will have her greet you somewhat solemnly by saying; "Renee Geonette. My husband, Salomon, has a court commission to compose a symphony." Asking her about the Imperial City will have her explain that her husband was to compose a symphony for the late emperor, but as her husband will explain if you speak to him, the commission is put on hiatus due to the assassination; "It's so sad. Salomon was to compose a symphony for Uriel Septim, to be performed for the whole city in the Arena." Esta página foi modificada pela última vez à(s) 05h44min de 20 de outubro de 2015.